RUSH: Here’s Todd in Charlotte, North Carolina. Your thoughts? How you are doing? CALLER: Hi! Mr. Limbaugh, mega dittos. CALLER: (muffled) Well, I have been ecstatic with this president, and I grow happier every time I hear him or even hear about his tweets. I loved everything he said! He’s becoming more and more my favorite president ever. So I love his courage and just seeing that bitter gumming Nancy Pelosi with her Depends in a wad, twisting every time something is mentioned is kind of bizarre. RUSH: You think that’s what the problem was? You think the Depends were kind of creeping up the crevice there? I thought it was maybe the adhesive for the dentures. RUSH: You think the Depends was kind of wadded up, huh? CALLER: Yeah, I do. She’s probably so loaded with some stuff, she probably needed a second pair on. But the Democrats in general are just always bitter. They don’t even show any attempt to get to the other side. Kind of like when you say the Palestinians start with, “Let’s start with killing all the Jews and go from there.” That’s how Democrats are. “We’re not gonna start with anything but defeating the Republicans.” There’s no working with people. It’s just defeat them. They need to be defeated. RUSH: Amen, bro. Amen. You know, it is interesting to hear other people’s reaction to this speech last night. I like to put myself in the shoes of the Democrats. I really… It may be a waste of time, but it’s not if the purpose is entertainment — and for me, it is. See, I don’t live any longer with the hope that the Democrats can be persuaded. I don’t care what Trump’s reputation is as a persuader. I mean, the Democrats in that body last night, the Democrats in the House and Senate. I understand there are Democrats listening to this program who will convert or being persuaded, randomly — and it happens frequently in small numbers, and it has for the entire period of time we’ve been on the air. But in mass numbers, it doesn’t and I don’t expect it to. And I don’t expect the Democrats in Congress to all of a sudden realize that they have been wrong about Trump. They can’t! They are locked in their position. Now, why are they locked? Are they locked because they’ve staked it out and they are being controlled by their madcap base and they can’t be flexible because the base will abandon them? Or is this who they really are? Well, depends on which Democrat you’re talking about. I’ll be honest: I think Chuck Schumer is not nearly the lunatic radical the people who vote for him are, but he’s still a radical leftist. But I think Chuck Schumer is a Democrat who would move off of some Democrat positions if he weren’t afraid of his base. I believe that most Democrats — and especially Democrat voters who do not watch anything other than Drive-By Media — really think that Trump is insane, really believe that Trump is unbalanced. They really believe that he is suffering from dementia. They really believe that he doesn’t read. They really believe that he doesn’t know anything. So they go into events like this fully expecting to see it. They don’t believe Trump can mask it or hide it. They don’t believe every word being put on a teleprompter will save Trump from going off script and “stepping in it,” so to speak. So what happens last night happens and they are clueless; they’re lost. It doesn’t compute. What they’re really mad about last night and remain angry about today is that Trump hit a home run. They are angry that Trump did it. They’re angry that Trump isn’t who they have been portraying him to be. They’re angry that America is improving with Trump’s policies. They are angry that Trump — as an outsider, a nobody, a know-nothing — is able to come in and reduce African-American unemployment in one year lower than it’s ever been with the Democrat being ostensibly on the case trying to make it happen for 50 years. So their anger last night — and there are many spokes on the wheel of their anger. They’re angry that Trump won, they’re angry he’s giving the speech, they’re angry that he’s succeeding, they’re angry that they haven’t got rid of him yet, they’re angry that the Russian colluding thing has bombed out. And it was a very informal thing. And then it was decided way back long ago that this should happen in person, the president should go up there and make a speech. And in our lifetimes, State of the Union speeches have not been about the state of the union at all. They have been the sitting president and majority party giving speeches containing laundry lists of the things they intend to provide or give as many people as they can, coupled with incessant criticism of the opposition party. For Obama, the State of the Union was a giant gloat occasion, and it was an opportunity to explain how he was going to transform America and to elucidate all of the problems that America had and all of the problems America caused and all of the wrongs and injustices traceable to America which needed to be fixed. And of course most of those were domestic, some of them international, but America had really failed in its mission of inclusiveness and diversity and civil rights and all of this. So the Democrat, Obama State of the Union was a combination of here’s what’s wrong with America that we’re gonna fix, and what’s wrong with America is basically the way it was founded and here’s how we’re gonna fix it. We’re gonna take things from people who have a lot and we’re gonna give ’em to you because you deserve ’em because you’ve been screwed. And we’re gonna cure cancer, and we’re gonna cure athlete’s feet, and we’re gonna cure this, we’re gonna do this, and it was just a giant wish list. Last night we actually got a state of the union. We have a president who established a premise that the nation is good, the state of the union is solid, it’s good, and it’s getting better. And what followed was the evidence. Evidentiary examples followed. Some of the examples involved his policies succeeding. Other examples were the stories of his guests in the gallery that he detailed. And every one of those people in that gallery last night, the guests, every one of those people had overcome adversity. They had achieved something great. They had experienced something horrible, but they were brought into the room to have it explained to them that everybody’s hearts in America were with them once it was learned what had happened and that this government was now attempting to root out the evil that had killed the children of some of the guests last night so that it hopefully would not happen to other families. They were brought into the room as a means of providing them comfort and as a way for the president to tell them that their loss was not final, that they are on a team, that they are in an extended family who grieve for them and with them and will do everything they can to make sure other families don’t suffer the same plight. Rather than these people remain anonymous, their stories unreported, but they, too, were examples of great strength. They, too, were examples of the unique American spirit. So we had a state of the union that was a state of the union with evidence, example after example after example. “It’s not going great ’cause I say so,” Trump said. “It’s going great because it is going great.” And his message was — and this is where he has this bond with the people that support him that remains somehow mysterious to people that don’t understand it — he let it be known to each and every one that he believes, first and foremost that he loves this country, unabashedly loves this country. He thinks this is the greatest country and wants everybody who lives here to think the same thing. And he thinks it’s the greatest country because of its people. And there was the bond, the connection once again being recognized. 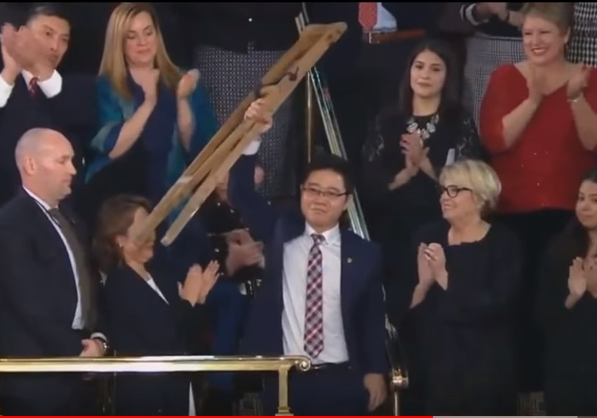 People he brought into the gallery, the young man from North Korea who engaged in a two-year journey against death and torture just to become an American. It’s all he wanted, just to become an American. He admitted to his captors in China that he was a Christian. That’s a death sentence. He admitted it. He went all through Asia, Vietnam, just to become an American. The value was also clear in showing oppressed people all over the world that there is hope for them because of the United States. But the other message was that you can do it. These people overcame their obstacles individually as part of an extended American family and nation. And Trump loves it and realizes that it is what it is, that we are what we are, the country is what it is because of our people and our founding. So it genuinely was a state of the union. It was a beautifully presented, truthfully illustrated state of the union. And the message was we’re just getting started. It can be even better. And it was a call to action and an expressed desire for everybody in that audience to climb on board and participate. I thought it was wonderful. I thought it was, in some ways, a speech that only an outsider and a nonestablishment type could give, because it takes an outsider to see America this way when inside the Beltway.